It might not have been the piece of hardware he was striving for this spring but a Prince Edward County native has a bright and sparkling silver lining to his third round playoff exit. 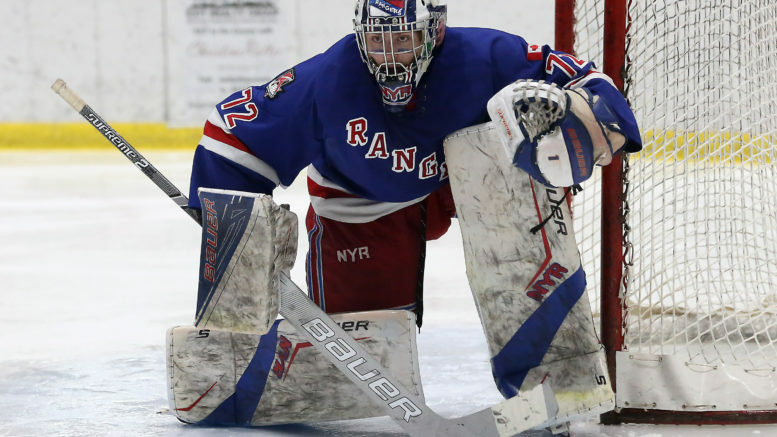 Jett Alexander will need another shelf for his trophy case as the North York Rangers netminder has been selected as the Ontario Junior Hockey League’s Most Valuable Player for 2018-19. The OJHL announced the 6’5”, 214 lbs Prince Edward County Minor Hockey Association alumnus was the top player in the league late Monday afternoon. The award was voted on by a panel of OJHL general managers and media reps who cover the 22-team league. 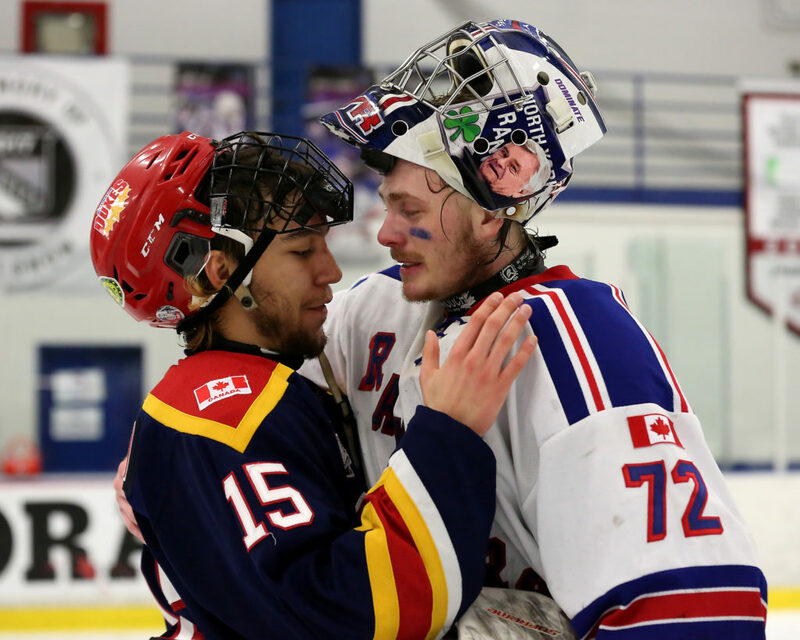 Wellington Duke Andrew Rinaldi and North York Ranger Jett Alexander embrace after the seventh game of the OJHL’s Southeastern Conference finals on Sunday at the Herb Carnegie Arena in North York. The 19-year-old has already been named the recipient of both OJHL goaltending awards. One was voted on by the awards committee, the other awarded to the netminder with the lowest goals-against average. The North York Rangers netminder led the OJHL with a 1.67 goals-against average and .945 save percentage. His league-best 30 wins, included 10 shutouts – breaking an OJHL record that dates back to the early 1970s. Billed from Bloomfield but living just ten minutes north of Wellington, Alexander played his early minor hockey in the PECMHA and later the Quinte Red Devils before moving to the Greater Toronto Hockey League for his bantam year. He tended goal for the Don Mills Flyers and North York Rangers AAA teams then signed with the Georgetown Raiders of the OJHL in 2016 but was dealt to North York during the 2016-17 season. Alexander, who has one more year of junior eligibility, was the OJHL Kewl Goaltender-of-the-Month and Canadian Junior Hockey League first star for October 2018. Alessio Luciani of the Markham Royals was runner-up in MVP voting. The Woodbridge resident won the OJHL scoring title (31 goals/45 assists) and was already named the league’s Most Improved Player. His Royals advanced to the third round of the OJHL playoffs this spring. Alexander, Luciani and other OJHL trophy winners will be honoured at a ceremony before Game 1 of the OJHL championship series Friday in Oakville. The finalists are the regular-season champion Oakville Blades and the defending playoff champion Wellington Dukes, who eliminated North York by winning Game 7 of their conference final Sunday.